The convergence of Internet-based IPTV, Video-on-Demand (VoD) and traditional broadcasting is happening now. As more and more web technology comes to television, the gap between web apps and native apps is rapidly narrowing. Firefox OS now supports the TV Manager API, a baseline of the W3C TV Control API (the editor’s draft driven by the TV Control API Community Group), which allows web-based applications to acquire information such as the Electronic Program Guide (or EPG) from service providers, and also to manage native TV hardware such as tuners and remotes. 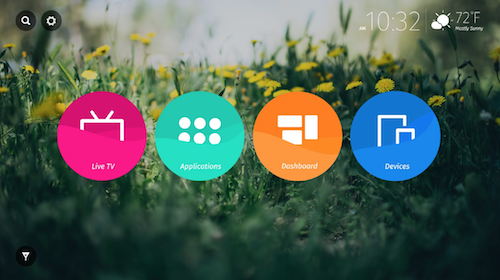 Firefox OS also relies on multiple API specifications to fully support TV functionality on a web platform. Some APIs are still on the road to becoming standards. Here is an overview of some common TV functions which can be implemented today via these Web APIs. One of the primary goals of the TV Control API is to enable standard use cases, such as channel switching and other activities generally available and expected in conventional remote controls. The API exposes specific tuner, channel, and EPG information to the web app and also allows indirect interactions with the tuner modules. Some applications, like virtual remote control, are easy to enable with this API. And the web content has the flexibility to manipulate multiple tuners if resource-permitted. In addition, event-driven notifications about channel scanning status and EPG updates provide a dynamic way to access broadcasting information. The following example shows how to get the available tuners and set the current playing source via the API. // Retrieve all the available tuners. // Just use the first tuner. // Set the 'oncurrentsourcechanged' event handler. // The current source has changed. // Get the supported source types for the tuner. // Just use the first source. // Succeeded to set the source. // Failed to set the source. // Failed to get tuners. // the stream for the first tuner. // variable |video|, just assign the stream to it. The Media Capture and Streams API and the HTML5 <video> element provide attributes and methods to help manage streaming contents. Combining the APIs and HTML5 elements makes the development of some advanced TV streaming scenarios, such as concurrent display for multiple streams (i.e., Picture-in-Picture), easier to accomplish and more flexible. While playing video streams, sometimes the media content provides multiple audio channels and even includes subtitles. For instance, a film or a sports show may be broadcast with multiple supported languages available for the viewer to select. Thus, there are two lists of VideoTrack and AudioTrack objects in the HTML5 <video> element to help the web content utilize available video and audio tracks respectively. Meanwhile, the Media Capture and Streams API also provides certain methods to dynamically manage associated media tracks. With this flexibility, web content is able to play a video stream that’s originated from another connected device, such as a camera. The HTML5 <video> element has a list of TextTrack instances. These tracks can be associated with a specific video tag to represent different instances, such as subtitles, captions, and metadata. In addition, multiple TextTrackCue objects containing time-sensitive data can be affiliated with them, and used to control timing of the display for subtitles and captions. The MediaStream Recording API provides a MediaRecorder interface to fulfill recording requirements over the MediaStream. It lets the web content select the appropriate supported encoding format for the stream, and also enables the recorded media to be accessed either as a whole blob or in smaller buffers. In cooperation with the Task Scheduler API and Service Workers, you can even add DVR-style scheduling functionality to your web app or web-driven device. On the other hand, the EPG data retrieved via TV Control API may also help the application record specific TV programs. Sometimes a public alert may be sent out via TV broadcasting or other communication systems when an emergency or natural disaster occurs such an earthquake, tsunami, or hurricane. A corresponding event-triggering mechanism included with the TV Control API can be used to help a web application manage an alert. // the playing TV signal. var type = event.type; // i.e. “Earthquake”. // Display the emergency information. TV broadcast mechanisms and applications are on a fast track to evolve rapidly, as is the web technology. Since many of the web specifications and APIs mentioned are still in the standardization progress, more functionality or further improvements might be added to make television experience more webby. As always, you can contribute to the evolution of these Web APIs by following along on relevant standards mailing lists and filing bugs when you find them. I have a DVB-T usb stick, with drivers supported under Linux. For a DIY tv, does B2G have usb otg support yet so I could plug the tv tuner directly into my Flame and watch tv on the phone? FxOS currently introduced a nsITVService.idl  which was designed for contributor to implement your own XPCOM component. This component will be responsible to provide the underlying TV service from your drivers / binaries / daemons to FxOS TV Manager. In this first version, FxOS didn’t build in some support like V4L-DVB. And we left that part to be done by our partner. How about Netflix? It looks like it will be available on Panasonic TV. Is there a Firefox ‘candidate release’ to watch netflix natively on desktop browser? As I understood, Netflix on Panasonic TV is “just” a web app. So if Netflix does provide a “watch” functionality on it’s website, it will work. The information in this article is very encouraging and implies the TV Control API is sufficiently robust to do some early work developing a minimally viable product. You mention making the “television experience more webby”, but what about making the web experience more television like, as in, allowing websites to be controlled by remote control? Are any plans in the works for reporting events in a more generic “universal remote”-friendly fashion so that different sites can be programmed to respond differently to the remote, but portable across a variety of remote controls? While I can see advantages to simply mapping certain remote control buttons to keystrokes (e.g., let’s say, “channel up” to “arrow up” and “volume up” to “arrow right”) so that certain functions can work out of the box, maybe an API could also allow for sites to define their own mappings. And while I realize that custom solutions can be done by interfaces specifically supplied to mobile devices via apps or web interfaces, I still like the idea of being able to experiment with the controls on the same hardware without having to learn new button mappings. About the remote control, W3C already added some keys from remote controller of TV into the spec “1.13 Media Controller Keys” . For example, there are key names for channelup/down and volumnup/down as well as the 4 color keys (e.g. ColorF3Blue) on TV already. Therefore a Web App can be designed to respond remote controller if TV platform followed these specs. Awesome info, thank you… I assume Firefox OS supports these then (also since I see these keys are referenced at https://developer.mozilla.org/en-US/Firefox_OS/TVs_connected_devices as well)? What about desktop support if I can ask?